Invasive plants have the ability to adapt to new environments – and even behave like a native species, according to University of Stirling research. A study has found that the behaviour of invasive plants changes over time – meaning plants of the same species act differently if they arrive in their new environment at separate times. 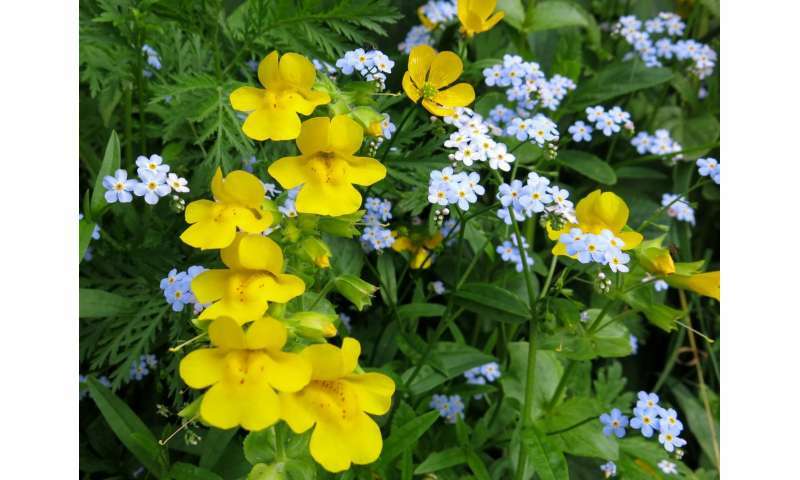 Scientists studied the characteristics of monkeyflowers (Mimulus guttatus), which first arrived in the UK from North America 200 years ago. They compared the behaviour of monkeyflowers long-established in Scotland with those introduced recently for the purposes of the experiment. Significantly, they found that the long-established plants were bigger and produced more flowers and more clones than those recently introduced. In comparison, the study showed that the genes of plants recently introduced are not well-adapted to deal with the UK environment. Dr. Mario Vallejo-Marin, Associate Professor in the Faculty of Natural Sciences, led the work alongside Ph.D. student Pauline Pantoja. "Our study shows that invasive plants – in this case, the monkeyflower – become increasingly adapted to new environments thanks to natural selection," he explained. "If we compare monkeyflowers that have been here for the last 200 years with those from North America today, they are completely different plants. It appears that, over time, the plants seem to become natives of their new home. "In other words, these results suggest that invasive populations of plants are better suited to live in their new home than new arrivals from the native range." The team created two types of hybrid plants – a UK/North American hybrid and a UK/UK hybrid – and grew them, under identical circumstances, to estimate the impact of natural selection. Over two years, around 1,200 plants were grown in a field plot at Stirling. "The main differences seem to be that the UK plants can produce both high numbers of flowers and high numbers of clones while the hybrids created from the North American samples can only do either many flowers or many clones but not both," Dr. Vallejo-Marin said. Reflecting on the findings, he added: "The last 500 years have seen a rapidly increasing spread of non-native organisms around the world. "Our study shows that, in older invasions – more than 200 years old – the newcomers are becoming adapted to their new surroundings through evolution by natural selection. "As more non-native species come of age, the role of natural selection in the success of non-native species will continue to increase." Dr. Vallejo-Marin is now planning further studies to discover how common the process is – and he believes others may also benefit from the work. "Understanding how organisms adapt to new environments is key in an era of rapid environmental change," he said. "Our study can also be of relevance to environmental managers dealing with biological invasions." "Invasive plants adapt to new environments." Yeah, that's part of what makes the "INVASIVE". Someone needed a study to understand that??? ?